Hi! Ula here again! I blog over at Lulu & Celeste and share the things I’ve made for my two little girls, Silly Bean (5) and Miss V (2) and for myself. I mostly share sewing projects/tutorials but I also have kids crafts up on my blog. This tutorial for a bunting decoration was one I first shared on Mabey She Made It, but it’s been modified and updated here! Buntings are fun to make and are great decorations. I’ve used them to decorate nurseries and my girls’ bedroom, craft fair displays and more! For this bunting I used store-bought bias tape but you could make your own if you prefer. 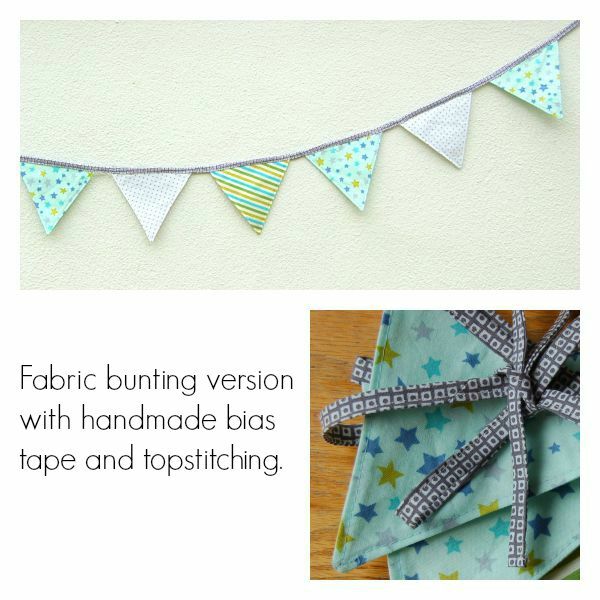 At the end of this post is an example of a bunting that I’ve made using handmade bias tape. 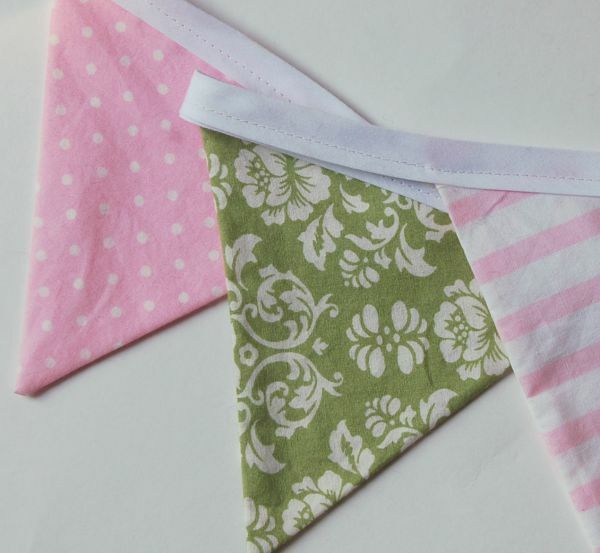 There are many ways to make bunting, this a double-sided sewn version with hidden seams. My bunting is 6′ long, with 9 flags/triangles each measuring approx 5.5″ in length. 1. Decide what size you want your triangles to be, for this bunting I made each side of the triangle measure 6″ long with a 1/4″ seam allowance included, so my finished triangles are about 5.5″ long. Draw your triangle onto cardstock and cut out. (Or you could also cut out onto freezer paper). 2. 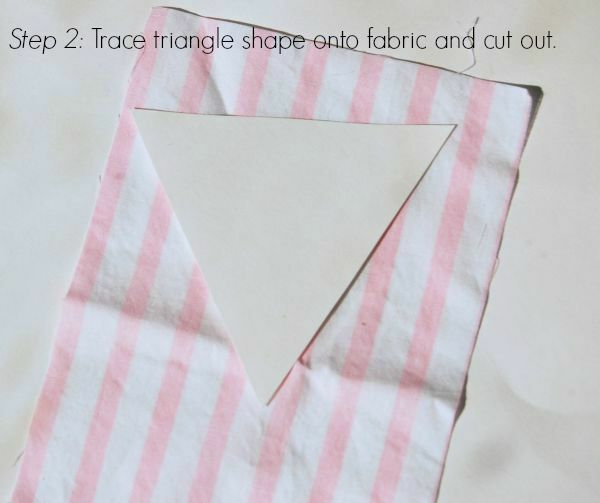 Using your cardstock triangle trace out onto your fabric. 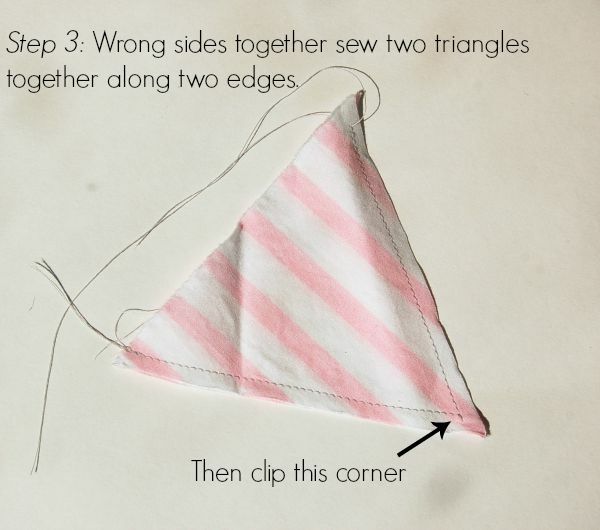 You will need two triangles to make one finished flag. So for mine I cut out 18 pieces. 3. Wrong sides together sew two triangles along the two side edges. Clip the corner and trim close to the point. Repeat with the rest of the triangles. 4. Turn right sides out and press. Optional: Topstitch along the two sewn edges. If topstitching, press again. Repeat for all triangles. 5. Open up the bias tape. Fold the short ends of the bias tape in by 1/4″ and press. Stitch in place. 6. Decide on the layout you like. Leave 1″ gap between each triangle. Baste the triangles to one edge of the bias tape in the order you like. 7. Fold the bias tape over and sew along the entire folded over edge. Ula blogs over at Lulu & Celeste. Read more about Ula here, and find her tutorials on her blog here. Fabric Grain- How much do you know about it? Sew Alongs & Clubs – you should totally join! 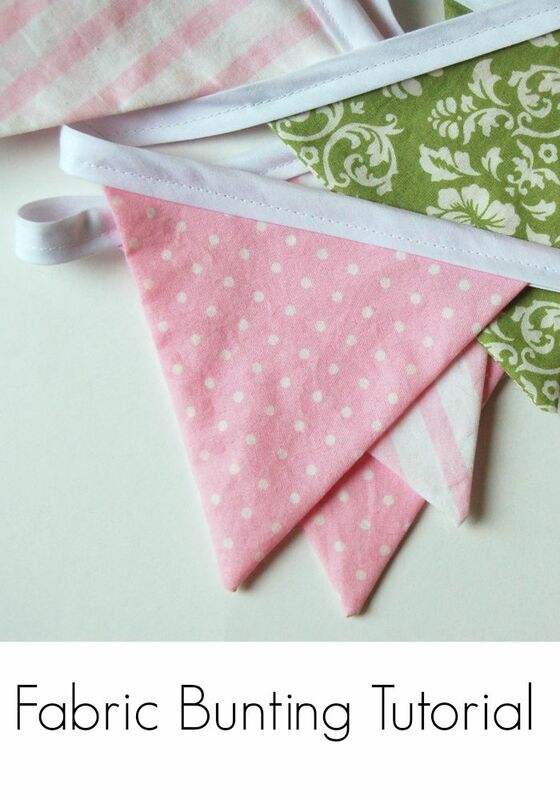 Thanks so much for the bunting tutorial.Now I really have no excuse for not making one. You are welcome and yes, no more excuses. I’m thinking one in every holiday would be fun. Easy to store and quickly change too. Why do you sew wrong sides together? I don’t get it? oops, that should be right sides together. Ha, totally missed that I made that mistake in the instructions. Sorry for any confusion.